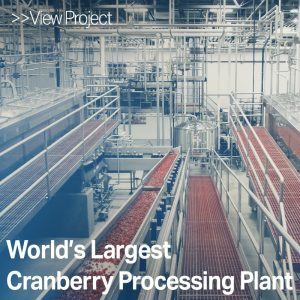 Sanitary facility design is of the utmost importance to fresh fruit and vegetable processors. The very act of fresh-cutting removes a plant’s natural barriers and creates areas where, if introduced, bacteria can grow. Coupled with the fact that the moisture content of produce is conducive to pathogen growth and the lack of a lethal kill-step (heat) during production, it is critical that microbial food safety hazards be minimized through good design of the processing and packaging areas. Dennis Group are experts at hygienic zoning. We design facilities so that low and high care areas are clearly defined and separated with solid barriers and proper space pressurization. 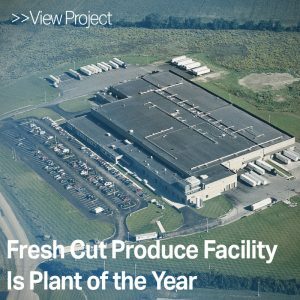 We have worked with fresh-cut, frozen and canned products, and our expertise in this field has been recognized on two different greenfield facilities built for Dole that were honored as Food Plant of the Year by Food Engineering magazine and Refrigerated and Frozen Foods.